The ad interim Director of the Vatican Press Office comments on the private lunch with Pope Francis and a group of young people representing World Youth Day. 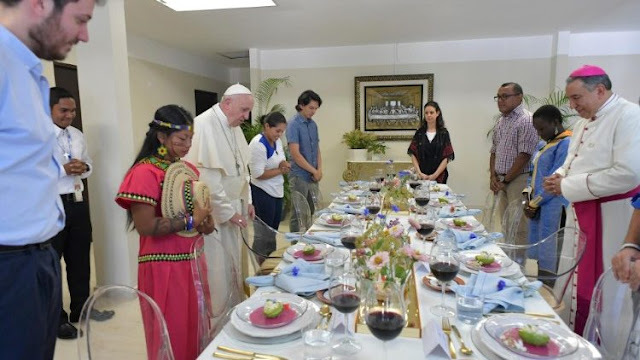 It was lunchtime when Pope Francis finished celebrating Mass with priests, religious and members of lay movements in the Cathedral of Santa Maria La Antigua. Anxiously waiting to join him at table , in the nearby Major Seminary of San José, were ten young people of different nationalities, representing the many thousands who are here in Panama to participate in the 34th World Youth Day. The lunch with the young people was a private occasion. But it was followed later in the day by a press conference, led by the ad interim Director of the Vatican Press Office, Alessandro Gisotti. Speaking to Vatican News, Gisotti describes the new kind of listening between young people and the Church. “The message the young people are delivering to Pope Francis”, says Gisotti, “is that we need to be listened to. The theme of listening is very present in this pontificate”, he says. In Spanish they call it “la terapia de la escucha ”, listening therapy. “Young people are saying every day with their every gesture, in every important moment of this World Youth Day, that they want to be listened to”, he says. “They want adults to take them seriously”. Gisotti is convinced young people have found “an incredible ally” in Pope Francis, precisely because he takes them so seriously. The private lunch is a traditional element in the WYD tradition. What struck Alessandro Gisotti , is the attentive way the Holy Father listened to his young guests around the table, even trying to speak to them in English and French, and making sure everyone understood what everyone else was saying. “I spoke with him after the lunch”, says Gisotti, “and he told me how important it was for him to listen to these young people, even when it wasn’t easy to answer their questions”. “Listening is a gift”, he continues, “not only for the youth, but for us adults, us parents, for people of the Church”.